Great Red Dragon - Freddie Mac - Fannie Mae - The Abyss? 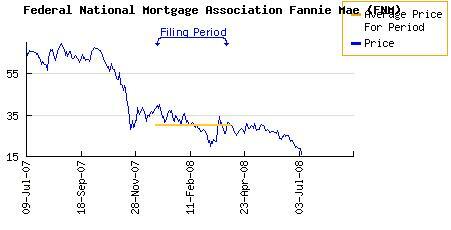 Freddie Mac - Fannie Mae - The Abyss? Freddie Mac and Fannie Mae fell to the lowest in 13 years in New York Stock Exchange composite trading as concerns grew the two largest U.S. mortgage-finance companies may need to raise more capital to overcome writedowns and satisfy new accounting rules. Freddie Mac fell 18 percent and Fannie Mae dropped 16 percent after Lehman Brothers Holdings Inc. analysts said in a report today that an accounting change may force them to raise a combined $75 billion. Here's a look at the charts. Can you decide where the charts are going to bottom?! Freddie Mac has had a 52 week trading range from 10.28 low to 67.20 high. 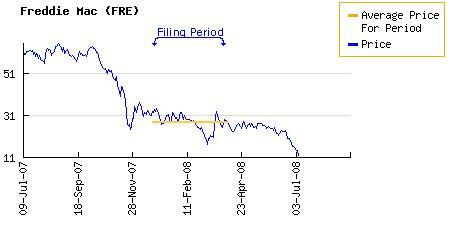 Fannie Mae has had a 52 week trading range from 14.65 low to 70.57 high. Now, let's see who bailed out and who jumped in. NOTE: The cut-off at 1 million shares was simply arbitrary. This chart shows the filing period of the data below. These are the folks that bailed out. These are the folks that jumped in. Freddie Mac data came from here. Fannie Mae data came from here. AXA and Legg Mason have made some very big bets. We'll just have to wait for them to file their June 30th figures to see what's next.